CITiZAN South East's Midwinter Update provides a fascinating view of the project’s activities elsewhere in Sussex over recent months. For more information about project CITiZAN please visit www.citizan.org.uk . For upcoming events, blogs and to get involved find them on Facebook, Twitter and Flickr. Email CITiZAN SE archaeologists Lara and Oliver with any queries. In mid-October all three teams plus Project Officer Stephanie met up in Cleethorpes for some training with our friends from the dating team at Historic England. The on-site element was at the submerged prehistoric forest there, which was great to see and compare with the forest that the South East team have been working on at Pett Level in East Sussex. The training days were a valuable exercise for everyone to learn advanced sampling techniques, meaning we can capture C14 and other palaeosamples on future sites. These can be processed by Historic England to give dating information and more. The team - we had to leave the beach sharpish as the fog rolled in. Always keep you eye on the weather when working on the foreshore and make sure you have a compass with you! 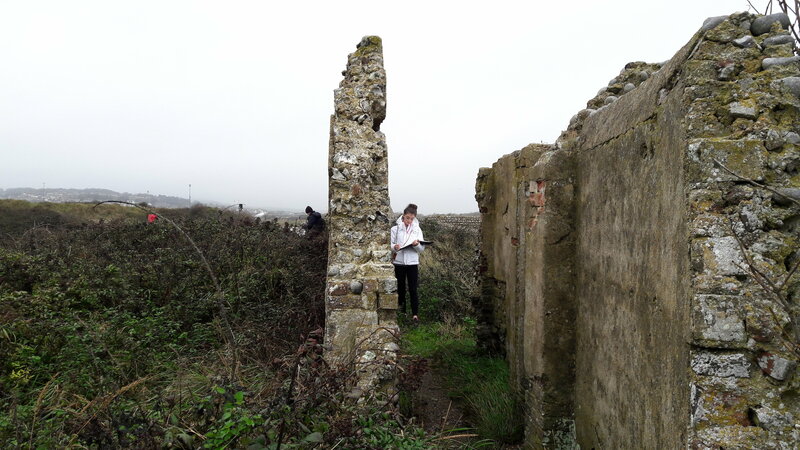 Later in October CITiZAN South East were at Bishopstone Tidemills in East Sussex. We'd been invited back for the third year by University of Brighton Faculty of Arts and Humanities to participate in the MA Students elective faculty option Land and Sea, an onsite drawing module. The students come from a range of disciplines including architecture, fine art, photography, 3D design and fashion. They visit six different sites over the course of the module: each visit starts with an insight from a different professional working in the locality e.g. the curator of the Jerwood Gallery, Hastings or the Harbour Master at Shoreham, in order to help them develop a deeper understanding of the sites they’re visiting. As with last year CITiZAN went with the students to Bishopstone Tidemills where, prior to their drawing practice, we led a guided tour of the remains of the First World War Sea Plane base, the Children’s hospital and the village itself, and took a look at the most recent excavations there by Sussex Archaeology Society. During the walk we discussed the effects of coastal erosion now and in the past on this stretch of coastline - it was actually a huge storm event that led to the closing on the tidemill and the eventual ruinination of the village. As with previous years the students responded really positively, asking pertinent questions and bringing up interesting points, particularly with reference to designing to cope with coastal change and bringing a sense of place to design work. This annual session has been particularly successful in engaging with 18-25 year olds and highlights the value of taking CITiZAN beyond audiences already interested in archaeology and heritage. And then it was time for the annual CITiZAN conference, Turn The Tide, this time hosted by team South East 2017. 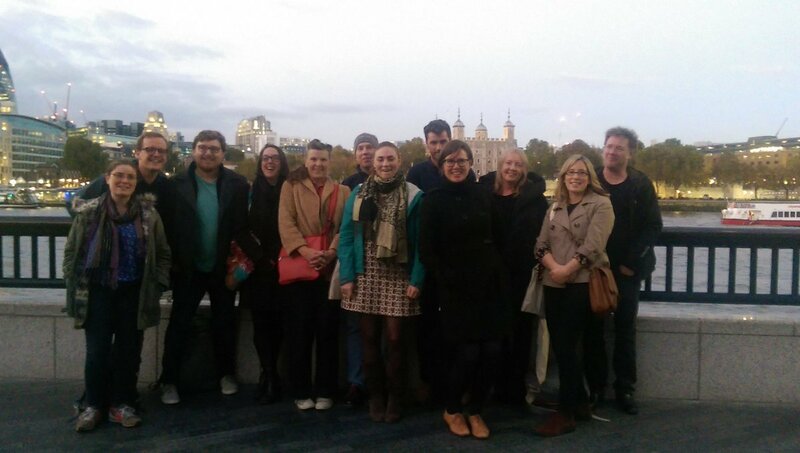 This year we joined forces in London with the Thames Discovery Programme and their annual Foreshore Forum. The two day event saw updates about both projects, talks on community engagement and discussion of climate change. 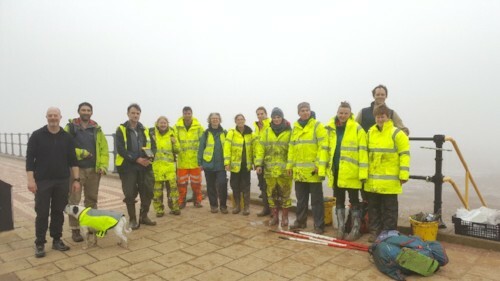 A special thank you to all the CITiZAN volunteers who came and who took part! See our blog for a 'live' summary of the two days, gathered together from social media posts. The TDP and CITiZAN teams post conference - tired but happy! Our final social engagement of the year was this week: TAG2017, the Theoretical Archaeology Group conference, held in Cardiff this year. Lara joined North team member Andy Sherman to co-present in the session Time and the Maritime. Our paper, Gifts from the Wrath of God: The re-animation of submerged prehistoric forests by coastal communities in the post medieval period (a very 'TAG' title) introduced CITiZAN’s work and discussed how the people of Cleethorpes have re-used the trees and timber from the forest there to create objects and gifts. We noted how, based on our work around the coast of England, this appears to be a phenomenon restricted to Cleethorpes. Of course bog oak is famously used in Ireland to make all sorts of objects, and if you know of any items made from the timber from submerged forests please let us know! Despite the diverse subject matter in the session (Neolithic/Mesolithic Baltic, Bronze Age Aegean, Romano British Cornwall and post medieval Cleethorpes) a strong theme that emerged was how people actively choose to use, or reject, coastal resources rather than just being passively at the mercy of environmental determinism. From this, and from a whole host of papers and conversations at TAG we’ve come back with lots of ideas to bring to our work.